At ergoCentric it is our mission to design and manufacture the best ergonomic chairs, but we also want to make sure you understand what to look for. Whether you are purchasing an office chair for yourself or many for a company it’s important to consider each person separately. In part one we talked about Quality and Adjustability, and why you need a chair that can adjust to you. But that’s not all it takes to be ergonomic or the perfect chair. You need to select components that fit your needs. The seat of a chair, for example, needs to be selected and adjusted based on the rudimental needs of a person’s body. We all come in different shapes and sizes and many people assume that just because they fit into the chair, that the chair fits them; however, that is not always the case. An improper seat can cause lower back and leg discomfort not to mention pain on your sit bones if it isn’t right for you. What do you need to look for in a seat? One size does not fit all. And the typical three sizes most chair manufacturers make only fits roughly 70% of the population. The seat size should allow you to sit back against the backrest while leaving approximately a three-finger width of clearance between the back of the knees and front of the seat. The seat should have a waterfall (curved downward) front edge to reduce pressure on the veins beneath the thighs. This is a sensitive part of the leg, which has many nerve endings and veins, and too much pressure on it can cause discomfort. It should subtly curve up at the sides to redistribute the user’s weight away from their seat bones to allow users to maintain comfortable pressure distribution across the seat. What the Seat should NOT Do. The seat should not be ‘dished out’ (dip inward in the centre), because it puts pressure on the veins beneath the thighs. It should not rise up at the back middle portion of the seat pan, as that puts extra pressure on the base of the spine and can cause discomfort and other ailments. The seat pan depth should be adjustable, because a seat that is too deep or shallow can cause lower back and leg discomfort. The seat depth must allow the user to sit back against the backrest, allowing the backrest to support the back properly. In addition, the seat pan should be able to tilt forward and backward, it should lock into any position to provide the variation of postures required by the human body, and it should have a tilt tension control if the seat has a free float mode. This enables the user to easily recline reducing stress on the low back. We will talk more about how to support the back with a proper backrest in Part three of, The Guide to the Perfect Chair, and if you haven’t already, check out Part One of the series. We talk about the importance of quality and adjustability. 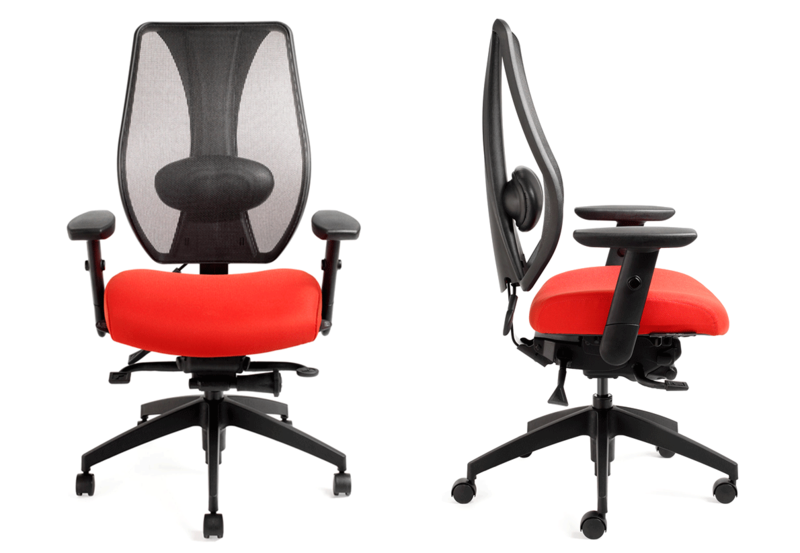 It’s a great place to start if you are looking to purchase ergonomic office chairs. The ergoCentric Team is here to help you. These articles are written to assist you in making the best decision for YOU, by breaking down the facts about ergonomics, office safety and much more. Have a question or concern about one of the articles you have read? Have an idea for an article or already have an article written and think our readers should see it? Share it with us! We encourage you to comment on the article or email us at [email protected]. We are always looking for new contributors to share their thoughts on ergonomics, safety in the workplace and much more. And don’t forget to subscribe, so you can be notified when a new article is written.